Out of the shadows and meaner than ever, volume three of this award-winning horror series packs international star power. Featuring ten brand-new stories by the legendary Guy N. Smith, the prolific Adam Millard, master of horror Nicholas Paschall, and others, this collection is certain to keep you up at night. Take care as you reach into these dark places, for the things here bite, and you may withdraw a hand short of a few fingers. Our award-winning horror series brings together the very best in international horror. 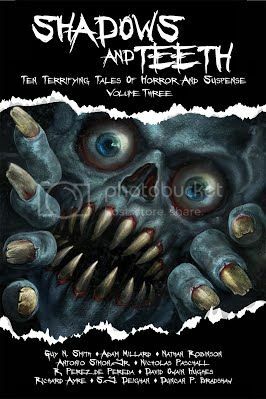 Volume three features the UK’s legendary Guy N. Smith, the prolific Adam Millard, and master of horror Nicholas Paschall, among other established names in the genre. Born in Cuba in 1941, Ramiro Perez de Pereda has seen it all. Growing up in a time when then-democratic Cuba was experiencing unprecedented foreign investment, he was exposed to the U.S. pop culture items of the day. Among them: pulp fiction magazines, which young Ramiro avidly read and collected. Far and away, his favorites were the Conan the Barbarian stories by Robert E. Howard. Ramiro, now retired from the corporate life, is a grandfather of five. He devotes himself to his family, his writing, and the occasional pen-and-ink sketch. He writes poetry and short fiction under the name R. Perez de Pereda. 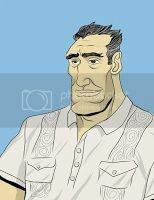 He serves Darkwater Syndicate as its Head Acquisitions Editor—he heads the department, he does not collect heads, which is a point he has grown quite fond of making. Indeed, it’s one reason he likes his job so much.